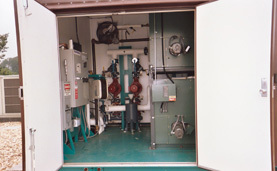 Delval Equipment Boiler can engineer a complete, permanently-enclosed packaged boiler room to meet your specific needs. The systems we engineer are constructed in either a rooftop package, or a pre-fabricated concrete and steel enclosure placed at ground-level next to an existing structure. The entire steam or hot water system is piped and wired with all of the necessary ancillary equipment to have a complete operating system. 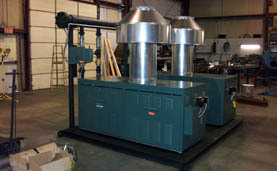 We build the packaged boiler rooms at our shop and then drop it in place at your facility as a permanent installation. 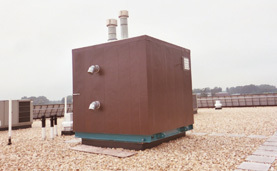 After we make a few simple connections to the building piping and electrical services, your packaged boiler room is ready to operate.